Belfast mum-of- two Deborah Barrett tells Lindy McDowell about the devastating toll that the condition has wreaked on her health while her sister Rhoda Lecky explains how they are determined to raise vital funds to help. Sisters Rhoda Lecky and Deborah Barrett may not look alike — Rhoda’s the blonde one, Deborah, a brunette. But they do have so very much in common. There are only two years between them. At 51, Deborah is the youngest of a family of six sisters. Rhoda (53) is next up in line. They both have loving partners and a son and a daughter each. And, okay, Rhoda lives in sunny Barcelona while Deborah lives back here in currently Baltic Belfast. But what binds them closer than ever right now — and their wider extended family around them — is the fight against the cruel disease that is gradually destroying Deborah’s health. History will remember 2017 as the year of Trump and interminable wrangling about Brexit. But most of us think in terms of more personal milestones and poignantly, this is how Deborah describes the year past on a GoFundMe page set up to help raise the £55,000 she needs. “2017 will always be a reminder of the year I lost a lot of my mobility and functions. I have become unsteady on my feet, using a walking stick on my good days and a wheelchair on my not so good days — which are becoming more and more frequent. “Everyday and night I am in pain. My memory is faltering. My speech is becoming more and more muddled. Bladder and bowel problems that I’m embarrassed to mention. “Every small or big symptom that becomes noticeable, adds to my ever-growing depression and anxiety. Without this treatment my future will be completely wheelchair-bound. For over five years now Deborah has been battling against the harsh, relentless onslaught of RRMS (Relapsing-Remitting Multiple Sclerosis). The money her family are hoping to raise will pay for a relatively new treatment, HSCT, in a clinic in Moscow which claims remarkable results. Deborah had just been to the dentist’s when I spoke to her. It’s only a few yards to walk, she points out, and her devoted daughter Emma (25) was, as ever, by her side giving her support in every sense of the word. There’s no hint of self-pity when she says this. Deborah is a battler. The disease she battles against was diagnosed in 2012. She was working back then as a pharmacy technician in Newtownards, travelling every day from her home on the Cregagh Road. Her symptoms were getting worse though. Deborah, then 45, went to her doctor and was sent for tests. At first they thought she might have had a stroke. But after a brain scan and a spinal tap, the news was broken to her that she had MS. Drugs which Deborah was given to help with the progressing symptoms left her, she says, with no quality of life. For a time there seemed hope when another treatment, a tysabri infusion, brought about improvement. But that treatment, which is administered every four weeks, may increase the risk of an uncommon brain infection called PML. Deborah was tested and found to be susceptible. The treatment had to be halted. In desperation she began to search the internet for other options which is when she came across HSCT (Haematopoietic Stem Cell Transplantation). In very basic layman’s terms this intense chemotherapy treatment aims to reboot the immune system to stop it attacking the central nervous system. Research has shown that many of those treated have seen a vast improvement in their condition. But the treatment is not without risk. And availing of it doesn’t come cheap. HSCT is offered privately at a number of clinics worldwide. Deborah was particularly impressed with what she’d read about a clinic in Moscow. The cost of treatment and recuperation there would be a massive £55,000. As well as Emma, she has a son Scott who’s 29. Both live at home and have been a loving support to her as has her partner, James Galway. “My rock,” she calls him. Emma is engaged to be married to her boyfriend Craig but the pair have yet to set the date. “My dream,” says Deborah who is divorced from her children’s father, “is just to walk Emma down the aisle. “Emma is now my full-time carer. As the disease progresses I’m know I’m going from bad to worse, and I don’t want to put that on her or on my son. “Right now I have difficulty walking. I have poor vision because of movements in my eyes I can’t control. Something like reading a book — I wouldn’t be able to do that. 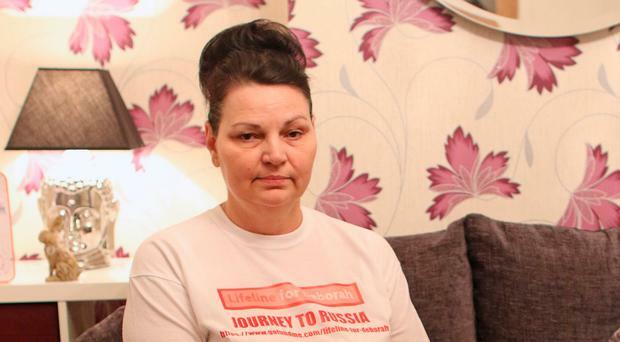 She had been due to have tests in the Moscow clinic in November this year, giving her family some time to get the fundraising effort up and running. But after reviewing her MRI scans which show increasing lesions, that’s been brought forward to mid-August. The whole family including Deborah’s four oldest sisters, Anne, Margaret, Elizabeth and Jacqueline and her mother, Charlotte McClure now face a Herculean task. The fundraising is being co-ordinated by Rhoda who teaches English in Barcelona where she lives with her engineer partner, Ramon Alfonso and her daughter Rachael (21). Her 29-year-old son Ian is married and lives in Glossop, Derbyshire. I mention a photograph on the GoFundMe site which shows a smiling Deborah on holiday in Barcelona in better health. “The illness had been diagnosed by then. I can see it in her when I look at that picture. But she had such a great time here. The weather was nice. She was very upbeat, very, optimistic, relaxed. “If she needed a new kidney...” Rhoda’s voice tails off. She is now throwing all her efforts into the campaign to raise so much money in such a short time to save the sister she loves. But both women believe it can be done. Already the response has been phenomenal. That ranges from individual donations to the proceeds from a bag-pack at the local Iceland and the family have been deeply touched by it all and are extremely grateful. Rhoda says; “It would be brilliant if we could land a large donation from, say, a local business. But the response from everybody so far has just been great. For Deborah every donation is a precious step closer to a treatment which might give her back her mobility, her health, her life. Her ambition is heartbreakingly modest, a reflection of the challenges she now faces every single day. Multiple sclerosis (MS) affects the brain and spinal cord. In MS, the coating that protects the nerves (myelin) is damaged, and this causes a range of symptoms. Once diagnosed, MS stays with a person for life, but treatments and specialists can help you to manage the condition and its symptoms. More than 100,000 people in the UK have MS. People are most likely to be diagnosed with MS in their 40s and 50s. In Relapsing Remitting MS, people have distinct attacks of symptoms which then fade away either partially or completely. Around 85% of people with MS are diagnosed with this type. In relapses, symptoms usually come on over a short period of time — over hours or days. They often stay for a number of weeks, usually four to six, though this can vary from very short periods of only a few days to many months. Relapses can vary from mild to severe. At their worst, acute relapses may need hospital treatment, but many relapses are managed at home. People often make a very good recovery from a relapse, with complete remission. However, this is not always the case and around half of all relapses may leave some lingering problems, however slight. This is because, if the damage to myelin is severe, then some symptoms remain, though they may still improve over the following months.